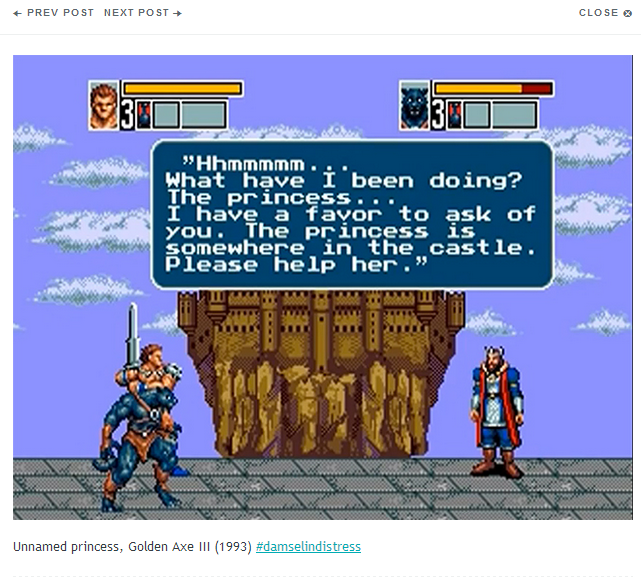 A while ago I was asked to comment on the Tropes vs Women Tumblr page, which currently is a list of supposed damsels in distress to show a pervasive problem of women in video games. Now one of the suggestions was for me to do a similar list of male characters in distress. That sounds like an exhausting amount of work for very little benefit so I won't be doing that. I will however use examples of the supposedly elusive dude in distress to further showcase how flawed and biased Anita Sarkeesian's research method really is. Now once again for the sake of disclosure: my position is that Damsels in Distress are an overused plot device, with that core premise I agree. Where I disagree is that the plot device is inherently bad and/or inherently damaging to women. In that respect I think Tropes vs Women is needlessly alarmist, terribly one-sided and overall very poorly researched. I am not here to argue that Damsels in Distress (or sexism for that matter) isn't a thing, just that there are enough legitimate examples so that we don't need to manufacture false ones and doing so only delegitimizes the complaint. My overall position is that a very simple increase in female protagonists would level out most of the problems (and a big problem standing in the way is the simple fact that female protagonists rarely sell well, so it's not just on the industry itself to push for some changes but on the audience as well). Trying to censor through shaming what people can and can't put in their artistic endeavors is not something I can get behind. No matter how much you would like to think so, I did not send Anita Sarkeesian any death threats and I do not condone people doing so. I do not even wish to silence her (which is a courtesy she or the gaming media have not granted people who don't share "the right opinion"). However I do not think she produces content that deserves any more recognition than it being a simple, frankly misinformed, opinion of a YouTuber. "As a trope the damsel in distress is a plot device in which a female character is placed in a perilous situation from which she cannot escape on her own and must be rescued by a male character, usually providing a core incentive or motivation for the protagonist's quest. In practice however her examples of damsels turn out to be whatever clip or screenshot she can show you of an inconvenienced female character under the assumption that her audience won't question anything about it. It doesn't matter that the person rescuing the damsel is actually a female character, whether she's the core motivation or whether she's important to the plot at all. Part of the explanation why she finds so many examples not fitting her actual definition is that just a bit later on she tries to sneak another, much more lenient definition of the damsel in distress past us. "All that is really required to fulfill the damsel in distress trope is for a female character to be reduced to a state of helplessness from which she requires rescuing by a typically male hero for the benefit of his story arc." - Damsel in Distress (Part 1) Tropes vs Women. 'Perilous situation' and 'core incentive or motivation' are reduced to a mere state of helplessness and the hero is no longer male but typically male. So while she starts out with a reasonable and fairly strict definition that would also be reasonable given her later definition of Dude in Distress, she ends up opening it up so much that every inconvenienced female character can count as long as she isn't the player protagonist. As we will see later, she refuses to look at Dudes in Distress with the same leniency. However that's not all, another problematic aspect of her definition happens just a paragraph before her original definition of the Damsel in Distress. "The tale of how Krystal went from protagonist of her own epic adventure to passive victim in someone else's game illustrates how the Damsel in Distress trope disempowers female characters and robs them of the chance to be heroes in their own rite [sic]"
This is true for Krystal having a reduced role in Star Fox Adventures (I won't go into detail how her characterization of Dinosaur Planet and Krystal was wrong, that's been done before by plenty of people), however this is problematic for several other games in the list, especially since this statement happens as the general introduction to the topic. In fact she even goes on to reinforce it later on. "In this way the Damsel's ordeal is not her own, instead it's framed as a trial for the hero to overcome. Consequently, the trope robs women in peril of the opportunity be [sic] the architects of their own escape and therefore prevents them from becoming archetypal heroes themselves." This becomes problematic because it assumes that the damsel'ed character is the only female character available in the game, and thus the main protagonist has to be male. Furthermore it makes the assumption that the damsel'ed character is hero-material in the first place, not everyone has the skills or fortitude to become a hero and that's what makes characters different from each other (unsurprisingly, not every male character is cut out to be a hero either). It also becomes problematic for female characters who become playable once rescued, since they do become heroes in their own right. In fact, if Dinosaur Planet was released as planned, it would be incredibly probable (considering its late release in the N64 life cycle) that the game wouldn't have found an audience at all and Krystal, despite having been this awesome protagonist, would have been completely forgotten. Her being a damsel in Star Fox Adventures however meant she eventually became a beloved member of the Star Fox team playable in Star Fox Assault and Star Fox Command and frequently petitioned (though so far ignored) as a fighter for Super Smash Bros. Krystal became a beloved character while her predecessor, Vela from Jet Force Gemini (a game which was released with her as a main protagonist in a cast of three), has been largely forgotten by the mainstream public and is unlikely to resurface soon. In the context of this last statement she also mirrors the player character escaping on her own to a non-player character having to be rescued as if they are on a level playing field. This is obviously misleading because the player character, by virtue of being the player character, is there to solve the problems of the people he or she encounters. This is basic player agency. What Anita doesn't do at all is mirror female damsel'ed characters to male characters in distress, which is a more reasonable comparison. At most we get a very short segment in part 3 where she shows a very short list of examples where female characters have to save their boyfriend (and this time she does hold the examples specifically to the definition and even misses a lot of notable examples, unlike when she lists Damsels in Distress where she grabs everything she can with a passing glance pass off as a damsel). We will get back to that when I discuss Dudes in Distress. "Second, and perhaps more importantly, damsel'ed female characters tend to reinforce pre-existing regressive notions about women as a group being weak or in need of protection because of their gender, ..."
So we have a problem here that's never resolved. Anita only ever talks about damsels as if they are the only female representation in the game, and thus as a whole represent women. If female protagonists or otherwise capable female characters are available, it means certain examples only count because Anita personally feels that they do. If there are male characters who also are completely incapable of escaping, it doesn't count (read: isn't even mentioned) because the protagonist is male and "larger, cultural patterns" (because men are so disposable they aren't even considered. Instead of subverting stereotypes, Anita is reinforcing them when they are convenient). Considering what Tropes vs. Women was meant to be, that's perhaps the most damning of all. This isn't a YouTube vlog where a person is giving her subjective opinion on certain issues, this is a well-funded project intending to be at least somewhat academic (and infamously claimed to be by MovieBob). Then there's the issue of "just how many of these damsel games are there"? 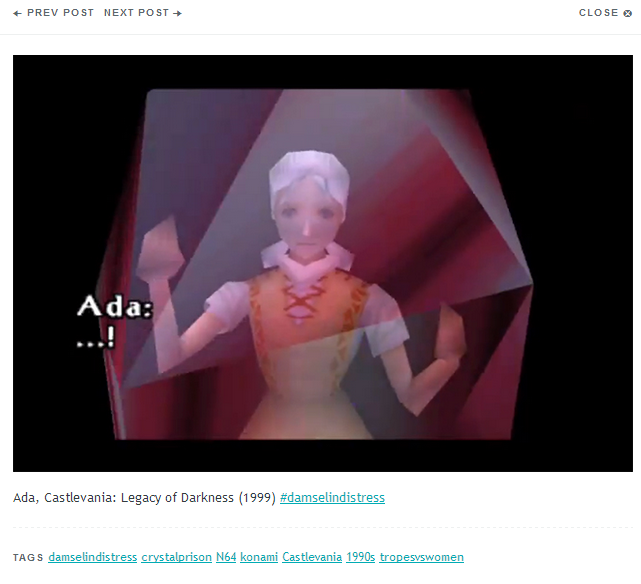 Anita's Tumblr blog devoted to chronicling Damsel in Distress games reached 400 entries on February 18 and continues to grow. For the moment forgetting that certain games don't need to be there at all (we'll get into that later, and from my own limited knowledge it makes no major difference to the number anyway). On its own that certainly seems like an enormous amount of games. Nintendo Entertainment System: 709 licensed, 113 unlicensed games. Super Nintendo Entertainment System: 784 official releases. Nintendo 64: 387 official releases. Nintendo 3DS: 494 (as of March 20, 2014). We are out of major Nintendo platforms (minus Game Boy Advance, for which I found no number) and already we have a staggering 7005 video games. We have only looked at platforms released by Nintendo, and already we can see that, according to the Tropes vs Women Tumblr, one of the most basic plotlines imaginable can only be found in a comparatively small handful of titles. Two possible explanations for this are that Anita's extensive list is actually extremely limited and there are a large amount of games she is so far unaware of, or that her overemphasis on the pervasiveness of the damsel in distress plot device is simply misguided. Either way the data she presents holds very little value. 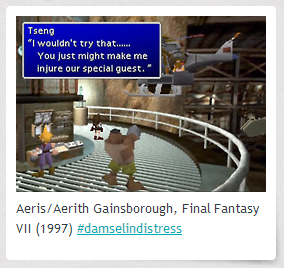 All we have right here is an extension of Tvtropes Damsel in Distress page presented for the sake of outrage. And that's just the games on Nintendo platforms. Let's see how many the other major platforms add to that amount. Sega Master System: 318 games. Sega Genesis / Mega Drive: Over 900. Once again I would like to stress that I agree that the Damsel in Distress plotline is often used as a lazy justification and we could stand to shake things up a little. That doesn't take away that the numbers presented by Anita Sarkeesian are basically meaningless for the argument she's trying to make. As I said earlier, the elusiveness of Dudes in Distress is mostly the result of Anita strictly holding to her own definition with the genders reversed, while not doing so with the straight up definition. In my original thoughts on Damsels in Distress (3.3 Dudes and Boyfriends in Distress) I already briefly discussed this and agreed that there is a hole to be filled when strictly speaking about female characters saving their love interests. However there is no shortage whatsoever when it comes to men having to be rescued, or even for women being the ones to rescue them. "But what about the reverse? 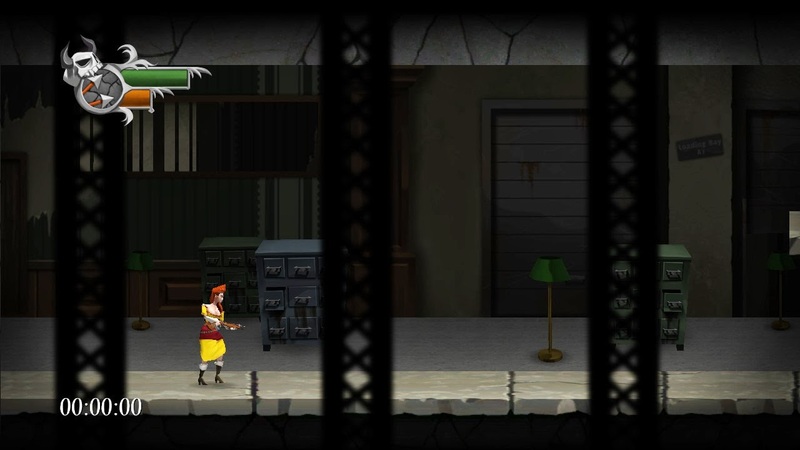 Are there games starring heroic women who must go on a quest to save a dude in distress?" That is indeed the reverse of her original Damsel in Distress definition, the one she abandons almost immediately after defining it, but it's not the reverse of the definition she actively uses throughout her series or on her Tumblr. If we were to look at men needing rescue the same way Anita looks at women needing rescue, our list would be phenomenally large very quickly. The sequel to Donkey Kong is Donkey Kong Jr., in which Donkey Kong needs to be rescued. When thinking about distress victims, you probably immediately remember having to save Princess Zelda during the last hour of The Legend of Zelda: Ocarina of Time. Did the 4 carpenters locked up in Gerudo Fortress spring to mind just as easily? What about the Gorons in the Fire Temple? You need to rescue Meryl Silverburgh in Metal Gear Solid? What about DARPA Chief Donald Anderson and the president of ArmsTech Kenneth Baker? 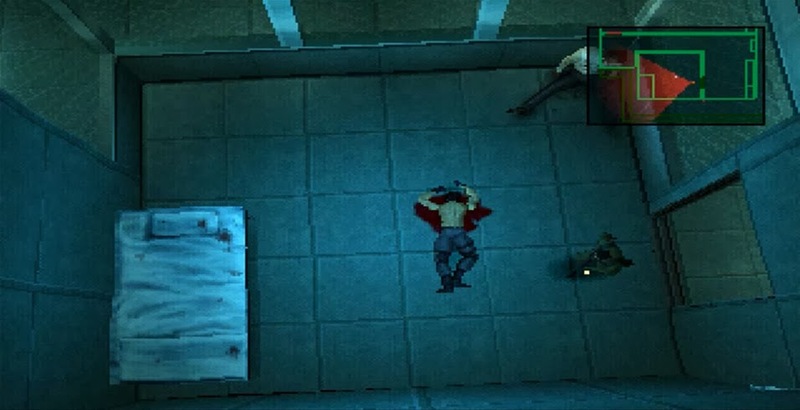 Richard Ames in Metal Gear Solid 2? Sokolov in Metal Gear Solid 3? ALL of whom turn out to be Disposable Dudes. In the Metal Slug series, you rescue *100's* of male POW's. Per game!. "Thank you Mario! But our princess is in another castle!" - one of several Toads you just saved in Super Mario Bros. In Super Mario Bros. 3, you rescue 7 male Mushroom Kings before you get to the princess. But from the above list only Metal Slug allows us to play as a female character through character select. Certainly we can do better. Let's also take a look at several games (some very high profile ones) where a female protagonist goes out to rescue men, yet somehow fell under Anita's radar while she scrounges for any and all Damsels in Distress for her list. "The two may appear the same, but they don't mean the same thing in our culture. This [damsel] is still a problem while this [dude] is not. Again, because one reinforces pre-existing stereotypes about women, while the other does not re-enforce any pre-existing stereotypes about men." Except it clearly does. Men are seen as disposable, so much so that them being put in distress isn't even taken seriously. Them being put in a position where they require saving is very often just a side quest not relevant (certainly not memorable) to the main story. It would absolutely be productive to create more narratives in which the disempowerment of men is used for the purpose of sympathy because stereotypically they simply don't get that sympathy. 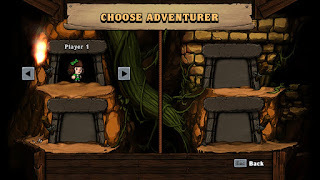 They are a joke and Anita herself highlights this by showing the Chippendale alternative to Spelunky's damsel. "To put it simply: men are neither supposed nor allowed to be dependent. They are expected to take care of others and themselves. And when they cannot or will not do it, then the assumption at the heart of culture is that they are somehow less than men and therefore unworthy of help. An irony asserts itself: by being in need of help, men forfeit the right to it." All in all I think debates over who or what is a "true gamer" is irrelevant. No one except you can tell you whether you like video games or not. However a lot of people, both supporters, detractors and the people behind Feminist Frequency themselves, make a big deal out of it so I'll address it. "4. I will never be asked to "prove my gamer cred" simply because of my gender." In this case he tries to weasel himself against refutation by specifically adding "because of my gender" added. Of course someone of the same gender isn't going to question someone else of the same gender to prove their gamer status because of their gender. This is simply a tactic to make it seem like critics (and again, actual critics) dismiss her status in the gamer in-group because of her gender rather than her blatant lack of knowledge and subsequent inability to address any of the criticisms in a reasonable manner. Even if all we knew about Anita Sarkeesian was her gender and her declaration of being a gamer, the request to prove it might have to do with her gender (even though it still would still be nothing more than simple skepticism). However, we do know several things about Anita Sarkeesian. 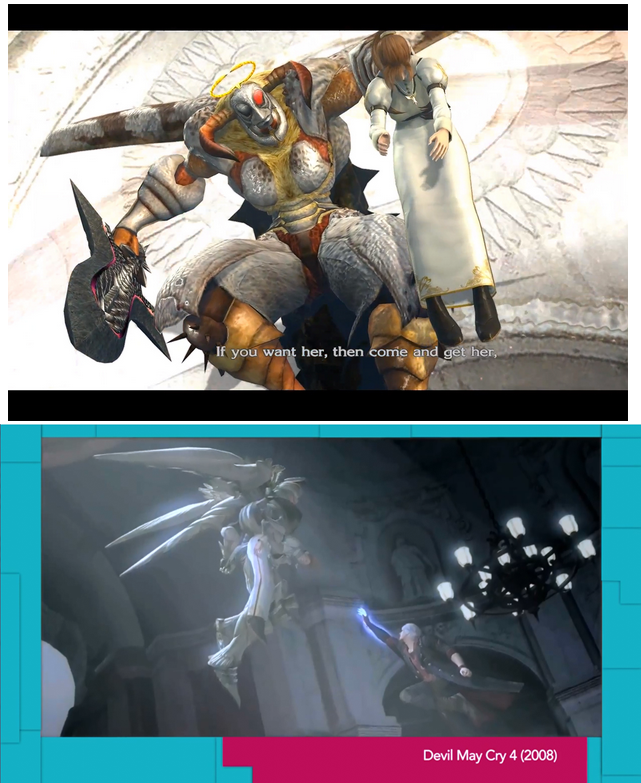 Even before Tropes vs. Women in Video Games she had made false statements regarding Bayonetta (which seemed to indicate she had drawn her conclusions from nothing more than the trailer) and used Fable 2 as an example of a male-driven revenge quest for a female family member (Fable 2 has a customizable hero, as such it is not male-driven). These were red flags oddly similar to how news media talks about video games without knowing anything about them, and this was long before her Kickstarter had begun. "This trope is when the media reports blatantly incorrect facts about a creative work that any fan would know to be wrong." Rather than her having to prove she's a gamer because she is a women, she is asked to do so because fans of video games pick up on the large amount of inaccuracies of her statements. If you think men are let off easily, one needs to look no further than the hatred the Irate Gamer has inspired since 2007 (who in some circles is still heavily flamed). The large amount of inaccuracies in his (especially early) videos as well as the controller not being turned on also made a lot of people question his status as a gamer. The most common accusation being that he just bought a bunch of old games from eBay to pretend to be a gamer. This is all before taking into consideration her video game footage wasn't recorded herself, but taken from Let's Plays. Despite the evidence being readily available and widely known since July 2013, Anita still claims she records her own footage. "For research and recording video game footage I use the El Gato Game Capture High Definition Game Recorder to collect gameplay. I have a number of systems including Xbox One, Xbox 360, Playstation 3, Playstation 2, Wii, Wii U, Sony's Playstation Vita, a Nintendo 3DS XL. I also use the El Gato box to capture iOS games on my iPad and iPhone with an HDMI adaptor." You can't just ignore these issues and contradictions and not expect someone to start asking some questions. How is it not shifty to proudly list your capture devices after it has been shown at least the vast majority of it was ripped from YouTube videos? Every modern gaming console records gameplay hours or achievements in some fashion. Instead of some actual evidence, we get some sad short story on Twitter about how she wasn't taken seriously when she was younger either. All that would have been needed to put this stuff to rest were some picture of console accounts with the hours and some identifier visible (obviously the account name would need to be obscured considering the potential harassment). But also I have to wonder how closely these people have been paying attention to the gaming community when they think only women are being asked to prove their gamer cred. This is basically the very first thing anyone has to do to show authority on the subject, and also the first thing anyone will bring up to take down an opposing party (usually in relation to the console wars). For example, here's a couple of YouTube videos in which male gamers call other male gamers out on not being (real) gamers. RiseToTheBottom - Blackbuster and his supporters arent true gamers!! Zephyrnix - @TruthBToldShow EXPOSED? Prove to us your a BIG gamer like us! Only women are being questioned for their gamer cred? What community have you been looking at? "However the Japanese game already had 4 playable characters, so the designers opted to include Toad and the Princess to fill the two remaining slots, building directly on top of the older pre-existing character models. So really, if we’re honest, Peach is kinda, accidently [sic] playable in this one." Going back to Anita's glorified-yet-false description of Dinosaur Planet, she makes a big deal out of the game being altered to fit the StarFox franchise. However when talking about Super Mario Bros 2, which was adapted from Doki Doki Panic (1987), she dismisses Princess Toadstool (later Princess Peach) being playable as "accidental". For the audience this tactic is meant to invoke the feeling that we were denied this fantastic game Dinosaur Planet, while the exact opposite happening is minimized as "accidental" and thus completely unimportant. (of course no mention that the same developer during the same timeframe replaced James Bond with the female Joanna Dark for Perfect Dark (2000), Banjo-Kazooie (1998) and Banjo-Tooie (2000) also having both a male and female protagonist at once, or that Dinosaur Planet seemed to be a primitively-themed spiritual sequel to the very much existing Jet Force Gemini (1999) featuring as playable characters a boy, a girl and their dog). Even if we go with the original version of Doki Doki Panic, the original cast had 2 female characters who were added completely intentionally. Again, why minimize positive examples and maximize negative ones when the numbers already speak in your favor? "Disguised as Sheik she is a helpful and active participant in the adventure and is shown to be more than capable, however as soon as she transforms back into her more stereotypically feminine form of Princess Zelda, she is kidnapped within 3 minutes. Literally 3 minutes, I timed it." This is a criticism often levied against the Disney movie Mulan (1998) which follows logic I simply do not understand. The criticism is that the women only get by in these worlds by having to dress as men. So? Does this not show that these women are perfectly capable of holding their own with the men? Simply dressing as a man does not grant one special man-powers. Ganondorf did not capture Zelda because now it was clear she was actually a woman, and ... well women belong in cages, I guess. She was captured because she was the holder of the Triforce of Wisdom and the uncrowned queen of Hyrule. 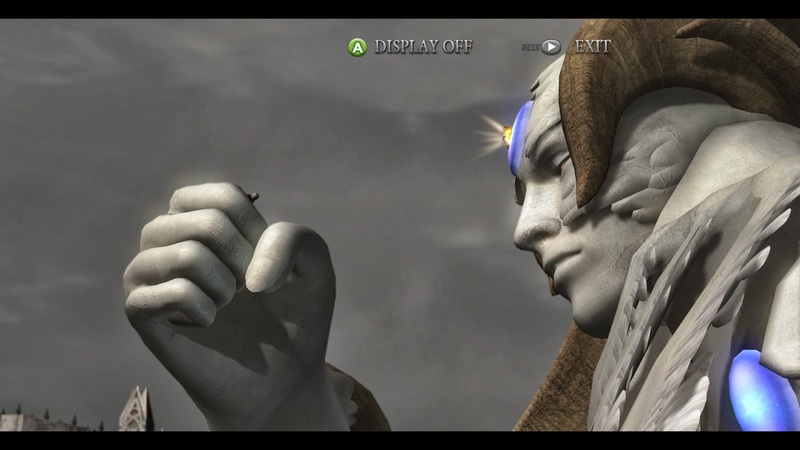 Capturing her was a way for Ganondorf to extend his power. Of course he also required Link's Triforce of Courage, but dialogue in the game suggests Ganondorf was perfectly confident in the fact that Link would storm his castle anyway and that a kid from the forest was no direct threat to him. Zelda, on the other hand, had proven that she was perfectly willing to disguise herself and sabotage his plans from the shadows for years. Also she had more direct knowledge and control over the powers of the Triforce, while Link just discovered he had it. Ganondorf saw Zelda as more dangerous than Link, which is why she had to be removed. My further elaboration on this subject can be found in The Ordeal of Queen Zelda. This probably should also have been an early indicator that she was watching Let's Play footage when making this series. It's not a simple scene you just watch, it involves a lot of text that requires player input to continue. Using "it literally takes 3 minutes" as an argument for this segment and hammering it home is like saying you were timing how look it took for you to read a few pages from a book and using that as a generalized argument, it doesn't make sense. If the player puts their controller down to go out for lunch, they wouldn't even need to pause the game for that scene to take 5 hours. Most recently Double Dragon Neon in 2012 re-introduced new gamers to this repressive crap yet again, this time is full HD. This is where I address MovieBob for a minute. His argument to support this statement was that Double Dragon aspires to BE regressive crap because that was part of the charm. That's right, Bob, except you and I see it for the parody that it is and love the game for it. Anita makes the argument that this is a bad thing and shouldn't exist. In closing, most of these issues would be forgivable if Anita Sarkeesian were a mere regular YouTuber offering her opinion on female representation in video games, but for a person with an academic background who received 160.000$ in Kickstarter money to provide in-depth analysis, who keeps collecting money and who is being awarded left and right by the gaming press, this is extremely shoddy. Tropes vs Women in Video Games is the opinion of one person (at most a small handful) masqueraded as something much larger than that. Her being one of the only big names pointing out these things is not an excuse, it should be even more reason to hold her claims to scrutiny. Now what remains is a list of examples of games found in either her Damsel in Distress videos or Tumblr I found either questionable or outright wrong. 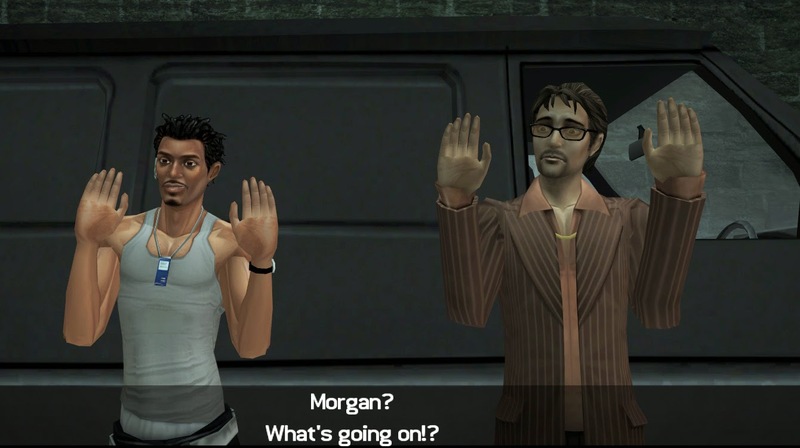 If the game has alternate scenarios that go unexplored ( for example, dudes in distress) I will also point those out. Spoilers might occur. We can assume most of the examples she lists fit according to her loosest definition by which Damsel in Distress means a female character who could essentially just be inconvenienced for it to count. Let's see a couple of examples that no longer fit when we actually hold her to her claims rather than the excuses and moved goalposts she piles on later on. Blatantly wrong examples are marked in red. It's given away in the title: the main characters are Banjo and Kazooie. They both work together to overcome Gruntilda's challenges and save Tootie. 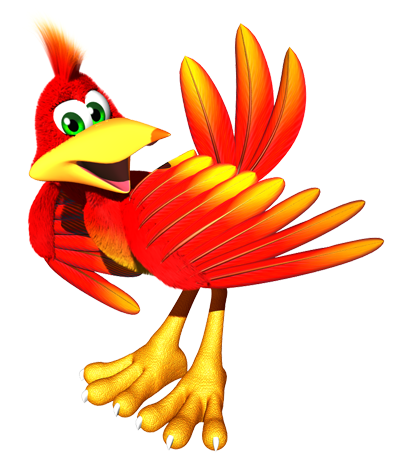 Kazooie, aside from being the hot-tempered wise-cracker of the two, is also female. The Jinjos (who aren't recognizable by gender) have to be rescued by the dozens. 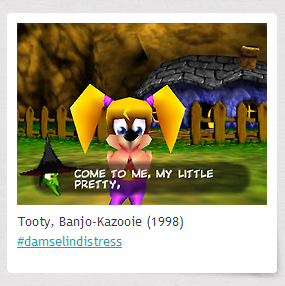 In the sequel (Banjo-Tooie), Bottles the Mole becomes the character to be rescued. 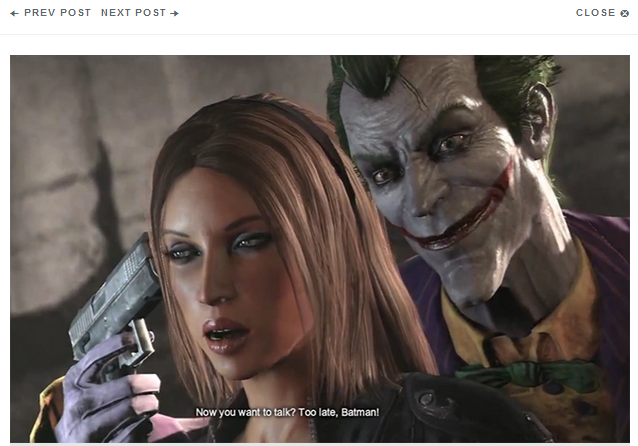 It's certainly a convincing shot of Talia Al Ghul being kept at gunpoint by the "Joker". Not shown is the follow-up where she easily breaks free and stabs him. Turns out her being a damsel was just for the purpose of retrieving Mr. Freeze's cure and killing Joker, since Batman never could. A character merely pretending to be a damsel who can easily escape and kill her captor doesn't fit Anita's definition of a Damsel in Distress. She barely fits her "everything goes" definition. For a list of Dudes in Distress for Batman: Arkham City, you can start by checking out the list of political prisoners, who tend to be the objective for several rescue missions. Even Mr. Freeze at one point needs to be rescued from the Penguin. As mentioned above, at one point Catwoman has to rescue Batman himself (and with Catwomen often being Batman's love interest, this would be a literal reversal fitting Anita's Dude in Distress). In short: the protagonists were not motivated to save Angel at any point, she was not in a perilous situation, she was not planning on escaping and the protagonist can very well be female. Ada herself certainly fits the definition of a Damsel in Distress. She has been kidnapped by Dracula's minions and is set up to be used as a sacrifice to resurrect him (although that's just a ruse to lure Cornell). So what's the problem? Well the fact that the game has multiple characters and storylines. Cornell having to rescue Ada is merely the prologue of Legacy of Darkness' main story and results in the resurrection of count Dracula. 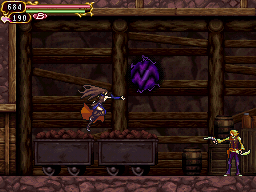 The people who actually get to go up against Dracula in this incarnation are Reinhardt Schneider (from the Belmont clan) and Carrie Fernandez (of Belnades blood). Anita's explanation that DiD's rob female characters of the chance to be heroes in their own right only holds up with the literal expectation that all damsel'ed characters themselves should have been heroes. It falls apart when you consider that other female characters can either do the saving or go on their own adventures. In terms of dudes in distress, during Cornell's adventure he also has to rescue a boy named Henry, who grows up to become a knight and sets off to Dracula's castle to save six other kidnapped children (3 male, 3 female). Same as the previous example, the danger in listing Castlevania games is that the main male protagonist (usually a Belmont) is often offset by a female protagonist (usually a Belnades). 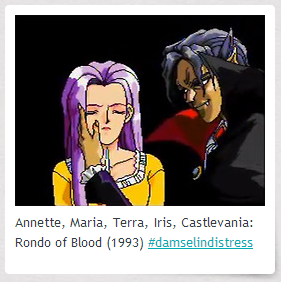 In Rondo of Blood we find Maria Renard (a distant relative of the Belmonts) as our female protagonist who is rescued early in the game and unlocked as playable. She is thus not prevented from being a hero and it doesn't even take long to have her available. Its sequel Symphony of the Night also has Richter Belmont as the one being kidnapped while Maria Renard sets out to save him (although she herself is not playable). The thing about Final Fantasy games is that the people you tend to have to go rescue are also members of your party, which includes Aerith. Not only that, but also playable are beloved characters such as Yuffie Kisaragi and Tifa Lockhart. 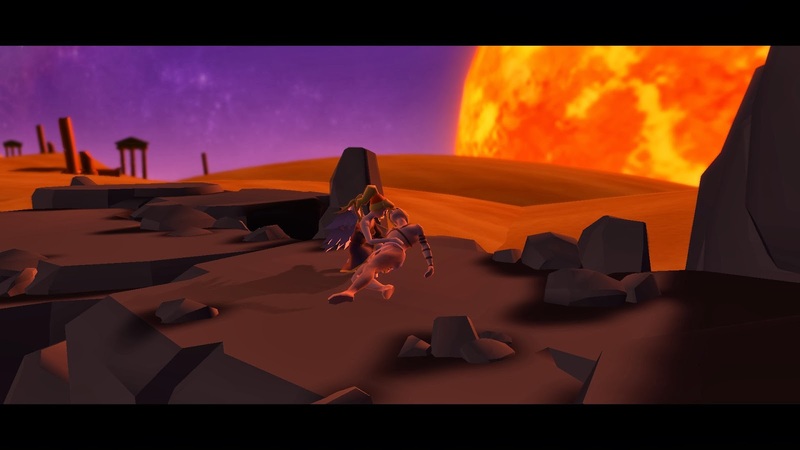 The screenshot shows us our masculine male protagonist and the equally masculine panther co-op character. A player preferring female characters would have been playing as Sahra Burn. In Resident Evil 4, Leon Kennedy sets out to rescue the president's daughter. It being a damsel in distress according to the general definition is no question. However the slight against Anita's claims are the fact that Ada Wong is running around helping and rescuing Leon during his mission. 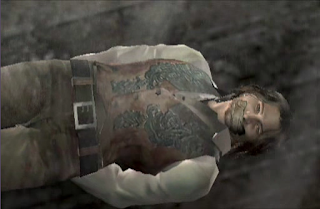 Despite being the player character, Leon can't overcome these situation without Ada's help. In the bonus content of PlayStation 2 and later releases she even becomes a player character in her own missions and story modes. In part 3 of Damsel in Distress, we are shown how the damsel can be switched out with a dog or a man. What we aren't shown is that there are multiple player characters, with a female one being available right from the start and several being unlockable. Of course you should forget that swapping out character models to tailor a game to your preferences is one of the primary strengths video games have. 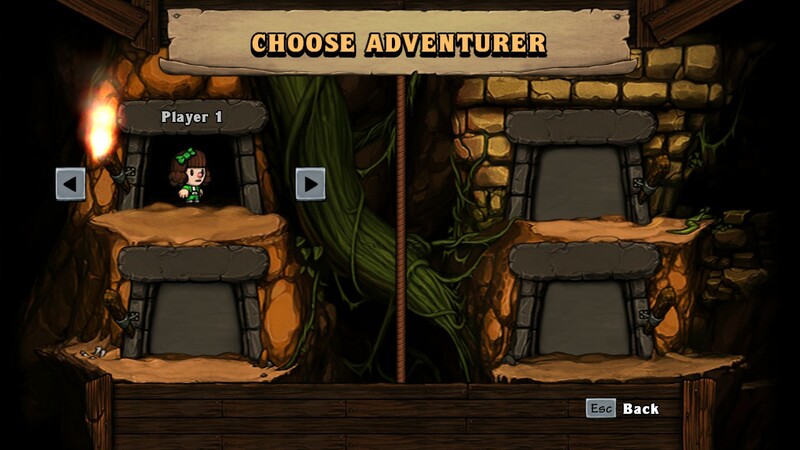 Using Spelunky as an example just brings to mind that H.L. Mencken quote: "Puritanism: the haunting fear that someone, somewhere may be having a good time." Since what kind of character you're using or what kind of damsel you're rescuing is up to the player. The TimeSplitters series has a very disjointed story. Only in the third game is there some sort of consistency. For TimeSplitters 2 the story is about two space marines, Sergeant Cortez and Corporal Hart (the female co-op player) who go back in time to retrieve the time crystals from several points in the past. 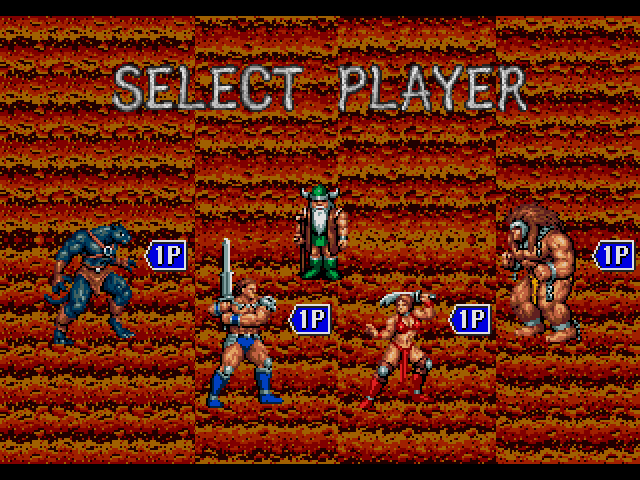 Notable is that in each time period the player character somehow becomes a different character based on the level's theme. 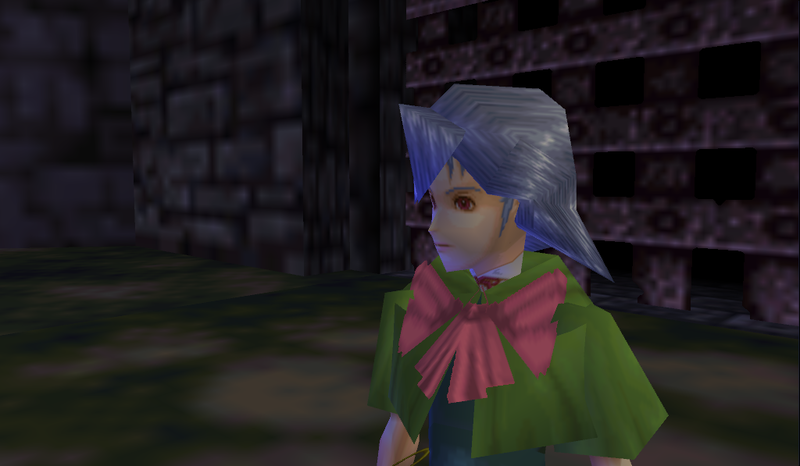 In the 1895 Notre Dame Cathedral level (pictured above), the player character becomes a female traveling troubadour in jester outfit named Viola. Not only that, but outside of the story mode ALL of the characters appearing (and several who don't appear) are playable including the very maidens you were supposed to save. For a game which thrives on multiplayer experience, this is a rather big deal. Kitten Celeste is tied to the tracks in the level pictured above and Jungle Queen is equally kidnapped. Jo-Beth Casey however is simply the co-op character for her particular level (among others such as Joanna Dark expy Amy Chen). Her being listed as a damsel is simply wrong. 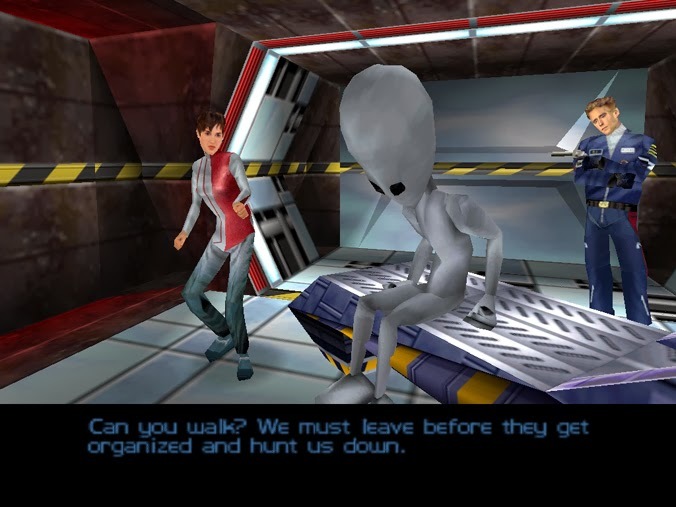 Similar to TimeSplitters 2, other female characters appear as co-op partners for Cortez. Also like TimeSplitters 2, this game is also multiplayer intensive and all characters, including Kitten Celeste and Jungle Queen, are playable. 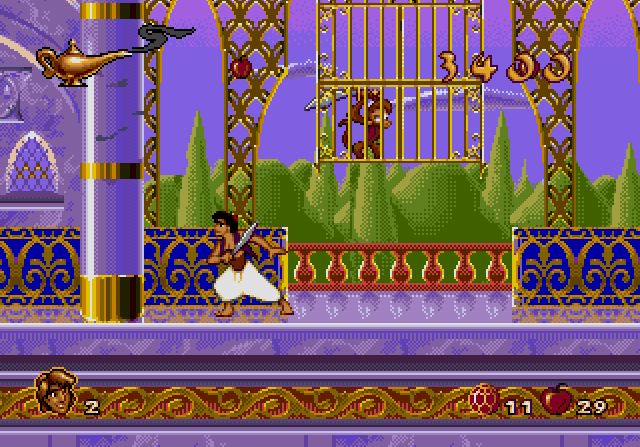 A particular example I found bewildering was the above screen of Aladdin for the Sega Mega Drive / Genesis. 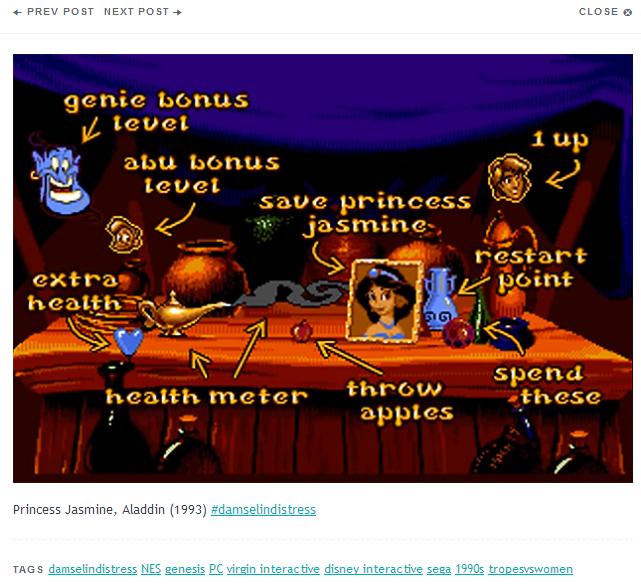 I played that game over and over again in my childhood and I don't remember Jasmine even being in the story. 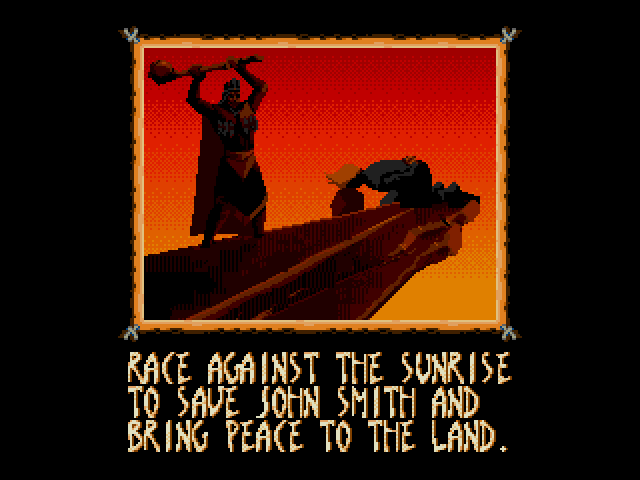 True enough, this screen appears in the game and it does say "Save princess Jasmine", but the rest of the onscreen narrative (and there's a lot of it) only ever refers Jasmine as the girl Aladdin met in the market who turned out to be the princess. Her sprite doesn't even appear until the end credits. The rest of the story is about Jafar tricking Aladdin into finding the scarab needed to access the Cave of Wonders, and then going after him when he steals the lamp from Aladdin. No hint whatsoever that Jasmine was in peril or in particular need of rescuing beyond this single screen in the beginning, yet good enough for Tropes vs Women to count as a Damsel in Distress. This is especially telling when in the past she dismissed Bechdel Test examples because the dialog wasn't long enough. It counts or doesn't count not because it fits or doesn't fit a definition, but because she wants to show you how bad the current situation in gaming is based on how many examples she can conjure up, legitimate or not. In her video Anita shows a clip of Devil May Cry 4 in which Nero reaches out for Kyrie while she is being kidnapped. Then she goes on a rant about unsophisticated male power fantasies about brooding male heroes and anti-heroes with Nero's picture in the back. Except Nero's brooding male hero power fantasy is cut short when he himself gets kidnapped very shortly after Kyrie, forcing the switch in protagonists to the wise-cracking Dante halfway through the game, who sets out to save Nero rather than Kyrie. Furthermore Kyrie is in the definite minority when it comes to kickass female characters in the Devil May Cry series. Far more prominent are Lady and Trish, who are presented as more or less Dante's equals (and both have since become playable in the Devil May Cry 4 Special Edition). Metal Gear Solid appears in the series (actually it doesn't, she mistakes Metal Gear Solid: The Twin Snakes for the original Metal Gear Solid) as an example of a male hero (Solid Snake) being able to escape on his own while female characters can't. Except Meryl escaping on her own is exactly what happens near the beginning of the game while Snake gets help from Otacon (which she even shows in her own video because the ketchup in Snake's inventory is given to him by Otacon while in prison). Also Snake's breakout happens after Meryl's, so it's unlikely she played the game at all otherwise she would have known this. What I'm looking for is a female protagonist having to save a man or men, not counting games with optional protagonists where the narrative doesn't change based on that choice. So for example, I won't count Borderlands 2 even though you can play as a female character saving men because the events play out exactly the same when playing as a male character. Needless to say, should we count games with optional protagonists the list would be nearly endless since a ton of RPG's would qualify. No Prince Eric in this game. You play as Ariel (or King Triton, in which case the roles are reversed, possibly making this a borderline example based on my definition. 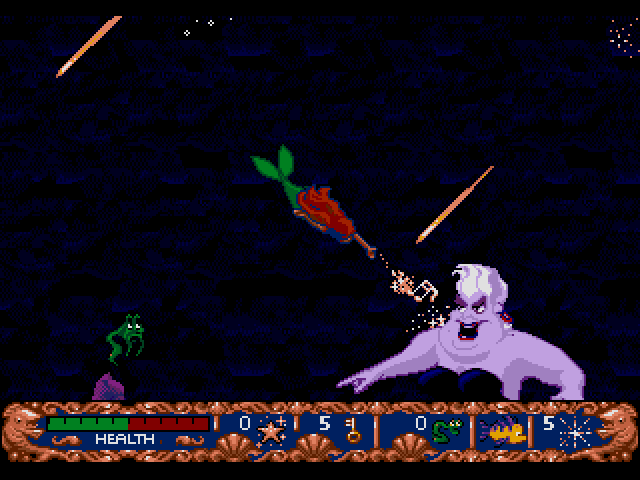 However, I list this game because of Ariel's importance as the assumed protagonist and the main character for the movies & series) and you have to go through levels, saving the other merpeople and eventually defeat Ursula to rescue King Triton. Selena's husband has been murdered and her child stolen. She must use her werewolf powers to get him back and take revenge. For all the examples Anita lists and the time she spends talking about it, I find it peculiar how no mention is made of Order of Ecclesia. In it Shanoa has to chase Albus (who is succumbing to Dracula's influence) while he kidnaps villagers. This all ends in a heartbreaking boss fight where he is beyond saving and has to be killed (thus becoming a Euthanized Dude, a concept so alien to Anita that she thinks it's supposed to be humorous when it shows up). This was a personal standard I had set for Damsel in Distress Part 3. While probably not very well known in the mainstream, it was one of the best publicized and best received releases for the WiiWare service (not in the least bit because it was a platformer reminiscent of Kid Icarus). In it Nyx travels the surface world of ancient Greece in search of Icarus who has fallen from the sky. A mother cat called Milky has to navigate a hostile town to rescue her son Michael. Joanna Dark has to save a scientist named Dr. Caroll, her boss Daniel Carington, an alien ambassador named Elvis (yes, really), the President of the United States, her co-workers and herself from an alien space ship. She then goes on to save the universe from an evil alien empire. It has been too long since I played PD Zero (the story mode of which wasn't very memorable to me) to remember the specifics, so I'll simply link to a guide explaining the mission. 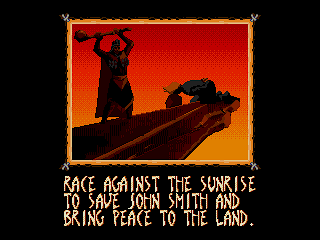 Similar to the movie, the last level is Pocahontas racing against the clock to rescue John Smith from being killed. 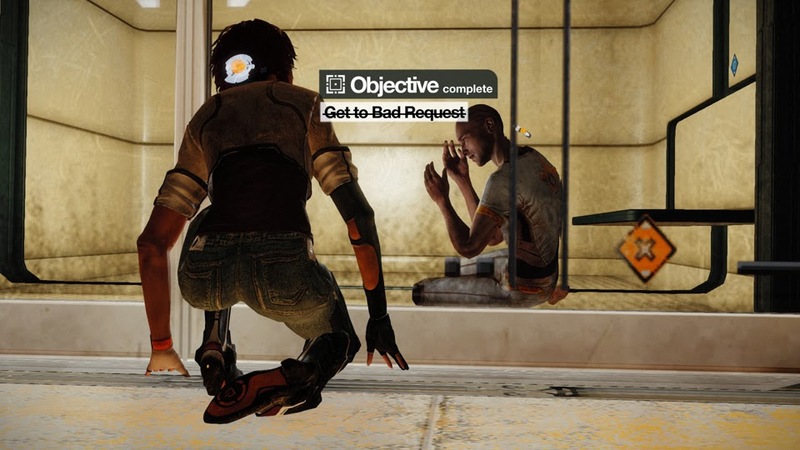 Mission 6 starts out with Nilin attempting to rescue fellow memory hunter Bad Request, her biggest fan who helped her earlier in the game. 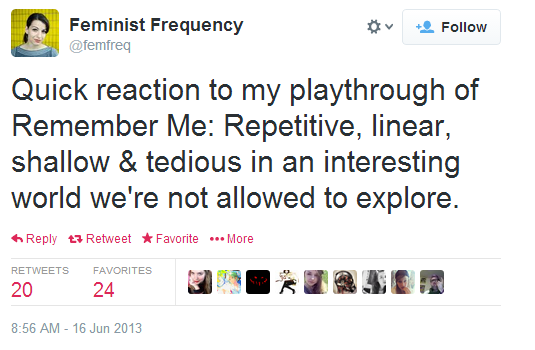 Particularly odd this example doesn't warrant a mention because of Anita's "review" of her playthrough of the game on Twitter several weeks before the episode supposed to feature dudes in distress launched. Didn't she remember the very emotional last levels? 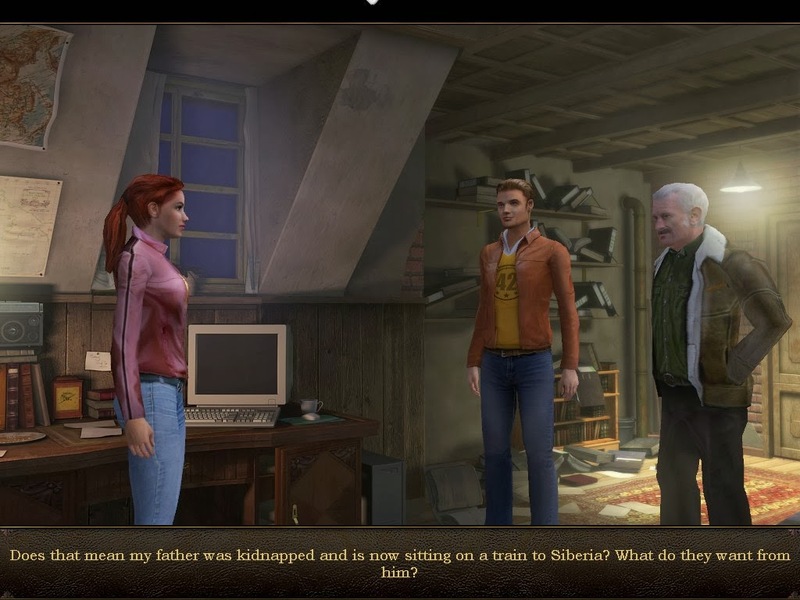 After the disappearance of her father, finding his office ransacked and with the police reluctant to jump into action, Nina Kalenkov sets off to find his whereabouts herself. While searching for the tomb of King Arthur, Lara overhears through her headset her mission control being ambushed by Rutland's men. Lara has to fight her way back out of the tomb in order to save them. Thank you for raising a point that isn't often made--not all female characters are built to be heroes and that's fine. Not all male characters are built to be heroes and that's fine. There are more ways for characters to fit into the story, and more points for people who read/watch/play those stories to relate to the character, than how many faces they punch in. Otherwise, there'd be no need for multiple characters because they'd just be the same, and that'd make stories boring. To call one type of character "problematic" and thus in need of elimination because they aren't "strong" enough is to kill creativity. To have a really expansnsive idea of what "problematic" means is just making a shoddy argument, which would be understandable if it was just a vlog series from Jane Q. Random on Youtube, but not if it as part of what is claimed to be a well-research, in-depth look at what makes certain tropes bad or good or not. Another good blog post, and thanks again.